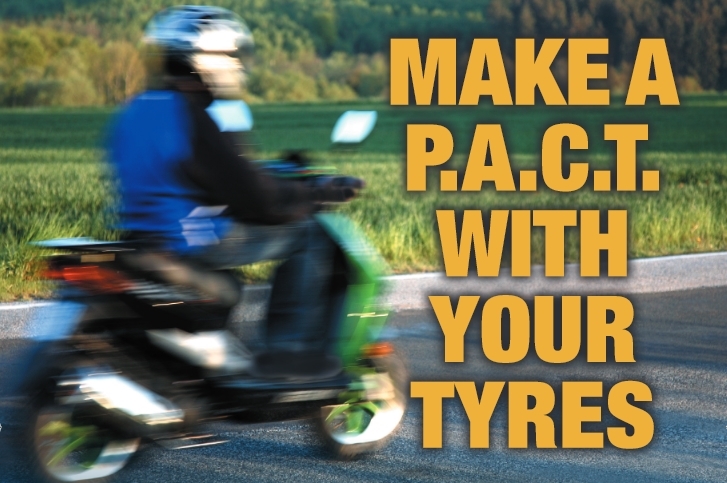 Whether you ride a motorcycle, scooter or moped, for maximum enjoyment, performance and safety, TyreSafe recommends making a PACT with your tyres. P – Performance, including grip, handling and fuel economy will all be improved with correct tyre care. A – Air pressure is essential for maximum performance. Pressures should be checked at least once a week using an accurate pressure gauge. C – Condition is critical to road safety. Inspect tyres for any cuts, bulges, uneven wear or objects embedded in the tread. T – Tread depth is essential for safety on wet roads. Check that your tread depth is not below the legal minimum of 1mm (for bikes over 50cc). Bikes under 50cc must have the grooves of the original tread pattern clearly visible. Correct tyre care is of particular importance during the spring as many riders of larger machines will be embarking on their first rides of the year. During the winter months when bikes have been placed in storage, tyres may have become damaged or unsafe so it is essential that riders give them a thorough inspection prior to use. Riders using their machines all year round need to ensure that their tyres are in a good condition in order to cope with the widely varying road conditions we experience in the UK. By making a PACT with your tyres, you can ensure that your motorcycle, scooter or moped is safe to ride and you can maximise your enjoyment on the road. Garages, motorcycle dealers, tyre retailers and other organisations can back the campaign and take advantage of a range of free support materials. Point of sale information leaflets and posters are available to help you explain to riders the importance of checking their tyres.